Can Ubisoft realise this sprawling, ambitious vision? The combination of a CGI trailer and Joseph Gordon-Levitt disarmingly boyish face at Ubisoft's E3 press conference made Beyond Good and Evil 2 feel almost impossible in scope. A grand, shared world space opera that serves both as a prequel to the story of the first BG&E starring memorable, colourful characters, and a massive solar system full of seamless multiplayer hijinks—can such a game even exist? Having seen a 30 minute hands-off developer playthrough during a behind-closed-doors E3 presentation, I don't think it does. At least not yet. To be clear, I'm not saying BG&E2 won't become what Ubisoft says it will, just that the road from what I saw to what they claim seems long. The demo begins in a forgotten temple in Ganesha, a city in the New Indian continent of the moon Soma. This is where the settlers of System 3 colonised first, creating a society where humans send animalistic 'hybrids' to the dark side of the moon to mine valuable resources. 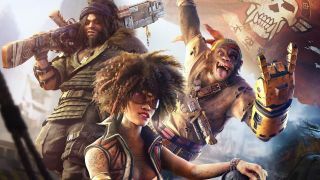 In Beyond Good and Evil 2's world, the people are infertile, and can only populate the world by cloning the DNA of the first settlers. Everyone is a clone, basically, which means the character you generate will be picked from a DNA profile—with individuality expressed instead through clothing customisation and fighting style. Your DNA decides your role in life, and hybrids are at the bottom of society. You play a space pirate captain, living outside of that status quo. It's a co-op demo. In the temple, two such captains are tracking down a group of scientists who are experimenting on hybrids. The devs wander around the location, at one point splitting up to arrive at the room containing the scientists from different locations. The devs reiterate that players will be able to go off and do their own thing separately. The players reveal themselves and are attacked by guards. Combat centres around four abilities: gun attacks, sword attacks, a shield and a jetpack. But each of these things can be augmented by tech that you'll find throughout the game. Equip a gun with a slowdown, and you reduce the movement speed of players that you shoot. Equip a sword with knockback, and, well you can probably guess. It's easy to understand the potential tactical implications of this combat system, but I don't really get a sense of it in the demo. I can imagine players working together, equipping aug tech designed to fill a specific role. You can even scan enemies to see what augs they have equipped, which lets you tailor your build to the upcoming fight. But none of this really plays out on screen—again, it's early. After the fight, we discover a hybrid has survived the experiment. The scanner tells us he's a mechanic, and, Ubisoft says, should we still need a mechanic, we'd be able to hire him for our crew. With the scientists thoroughly defeated, the devs head out of the temple and into the city of Ganesha proper. We only see a small slice of the city, and while the scale seems impressive, the visual detail leaves something to be desired. Still we get another hint of the freedom Ubisoft hopes to offer in the final game. One dev hops in a spaceship to go and dogfight with police, while another grabs a hoverbike to give us a quick tour. Using the scanner we can check distant landmarks, and are given suggestions as to what might (eventually) happen in them. A police station, for instance, could be holding a fellow pirate for you to free. A bank can be robbed of its cash. A shop can be visited for new clothes and equipment. One dev hops in a spaceship to go and dogfight with police, while another grabs a hoverbike to give us a quick tour. The demo ends with the dev jumping in a ship, hitting hyperspace and seamlessly flying their pirate out of the planet's atmosphere and towards their mothership. Mostly seamlessly, at least—the jump into hyperspace does lower the texture quality and detail of the city quite noticeably. That might seem like a pedantic point, but the guy sat next to me literally gasped during this sequence, and, while it's still an impressive sight, it's not magic. This is about managing expectations, after all. Ubisoft's final trick is to open the map screen—zooming out more to show the scale of System 3 and the many stars and planets within it. It's an impressive idea for a showcase, starting small, in a single temple, and expanding further outwards, to the city, to the planet, to the galaxy beyond. But I see little of what that grand scale means, and what detail I am shown still feels like it needs lots of time. And that's all fine—Beyond Good and Evil 2 is a long way off. It could definitely become something amazing. But it's not there yet.